Roberto Firmino Barbosa de Oliveira is a Brazilian footballer who primarily operates as a winger for the Brazilian national team and Liverpool FC. He has also been used as a “false 9” and in the central midfield by his managers. He grabbed attention with his skills during his time at Hoffenheim but is currently going through a purple patch after forming a lethal strike partnership with Mo Salah in Liverpool in the 17/18 season. Firmino was born on 2 October 1991 in Maceio, Brazil. Growing up in a crime infested city did not hinder young Firmino from pursuing his passion - football. He joined a local club CRB at a very young age and would spend time practising in the notorious neighbourhood before he got openings into the youth setup of Brazilian second division club Figueirense. Firmino made his international debut against Turkey in November 2014. He played for the last 17 minutes of a 4-0 win for the Selecao. Since then he has made 16 appearances for the team and scored 5 goals. His performance in 2015 Copa America was one of the few positive points in a disappointing campaign for Brazil. He has developed a decent partnership with Philippe Coutinho and Neymar which makes the Brazilian attack highly potent. Firmino burst into the scene in 2013/14 season for Hoffenheim. He already had a few decent seasons with them but he took his performances to another level bagging 22 goals in all competitions for Die Kraichgauer. It led to callups in the national team and he made his national team debuts that season. He left Hoffenheim for Merseyside in 2015 for a whopping £29 million. He took time to adjust to the requirements of the English game. Brendan Rodgers played him in various positions and his performances improved playing as a “false 9”. He reveled under Jurgen Klopp and even finished the season as top scorer for Liverpool in the league and also played a crucial role in their road to the finals of Europa League. He scored 11 goals in the next season for the Reds. However, Firmino’s current form has eclipsed his previous performances. He has had a phenomenal 17/18 season with Liverpool. He has combined with Mane and Salah to wreak havoc in the opposition defenses. Ball holding, neat dribbling and impeccable vision has been a feature of Firmino’s game this season. Anfield is now used to witnessing his neat backheel flicks and forward runs. Firmino has given birth to the audacious “no look goals” where he would flick the ball into the goal while looking in the opposite direction. While it was criticized for being disrespectful, the Merseyside isn’t complaining. He was scouted by the German club Hoffenheim from Figueirense owing to impressive display of potential and dexterity. Firmino took little time to acclimatise and started putting in decent performances on a regular basis and chipped in with crucial goals. He started drawing the eyeballs of the big clubs as he continued his progress in the German club. 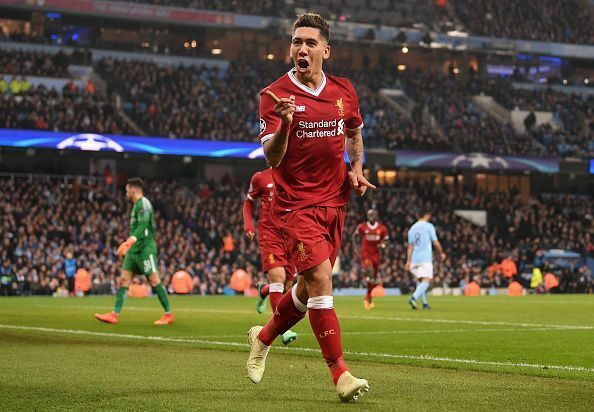 But it was the remarkable 2013/14 season where Firmino truly justified the hype around him by scoring 16 goals in the league and became the fourth highest goalscorer that season. In 2015, he made a high profile move to Liverpool. His hefty price was initially questioned and his style of play was scrutinized. However, after a slow start, Firmino started proving the critics wrong. He became one of their most important players in the 2016/17 season and is an integral part of the attacking trio with Mo Salah and Sadio Mane.